Honoring old-world craftsmanship, PLANET 6 Walnut is distinguished by hand-cut dovetail joinery, six drawers and contiguous woodgrain across all surfaces. It is crafted from sustainable urban walnut and embodies pride & authenticity. Dovetail construction provides strength and honors old-world craftsmanship. 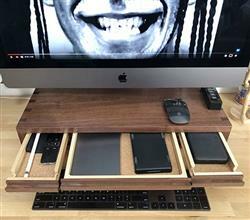 Six drawers provide ample storage for 9.75" iPad, smartphones, hard drives, etc. Drawer handles are cut from same piece of wood so grain is contiguous across handles. Four felt cable grips hold cables in place, making them accessible in drawers while connected to power or to your computer. Handy for flash drives and phone charging. Two phone rests prop up smartphones for convenient and discreet viewing. Located in left and right drawers. 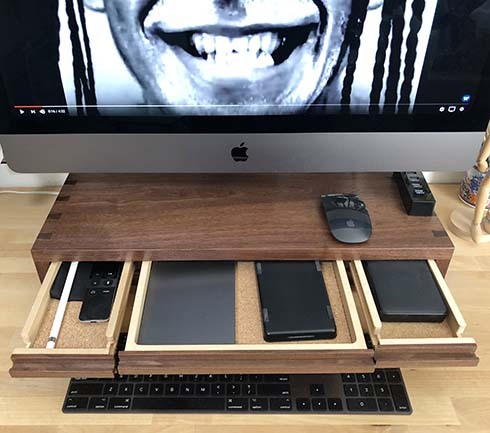 Sliding tray holds business cards and credit cards in side drawer. Two secret drawers hide checkbooks, cash, flash drives, pens, secret notes. 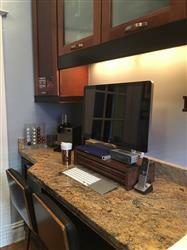 Premium Baltic birch plywood provides hidden strength and stability to internal drawer construction and iMac undermount. 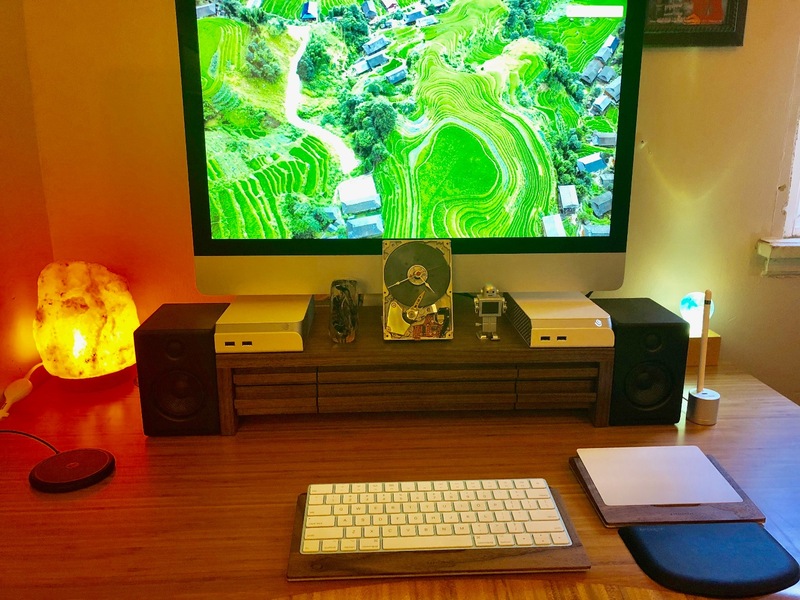 It’s not everyday that you encounter hand-crafted furniture with this much attention to detail so when I came upon the Planet 6 Walnut — I was absolutely gobsmacked at all the level details created for the monitor stand. 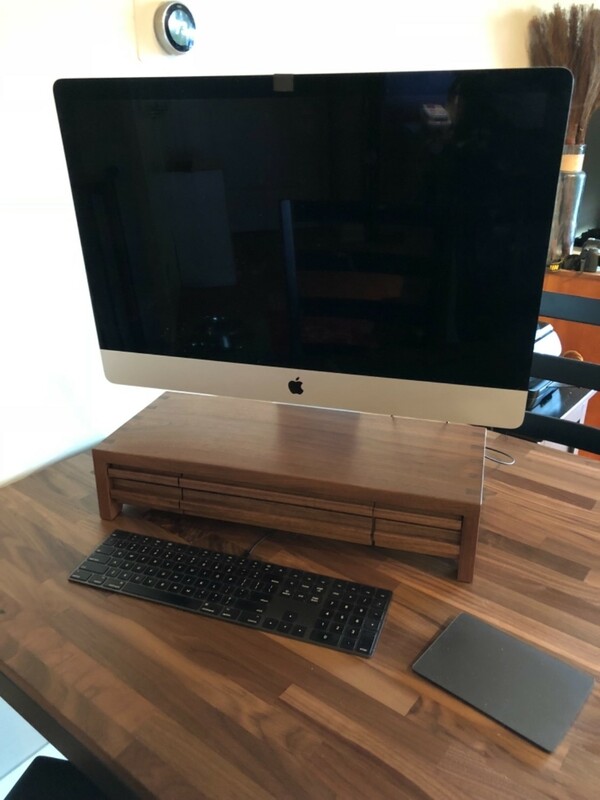 First, they designed a slot for to insert the stand so it’s at a more comfortable height — genius! 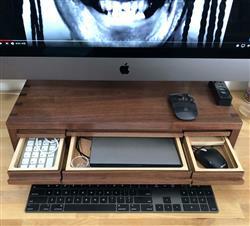 Secondly, all stands needs draws to store things and this stand comes with 6 plus to two hidden ones. I can’t rave enough about this stand. The only negative is that I WISH I had found your company before I wasted my money on all those previous wooden, bamboo, and glass stands. 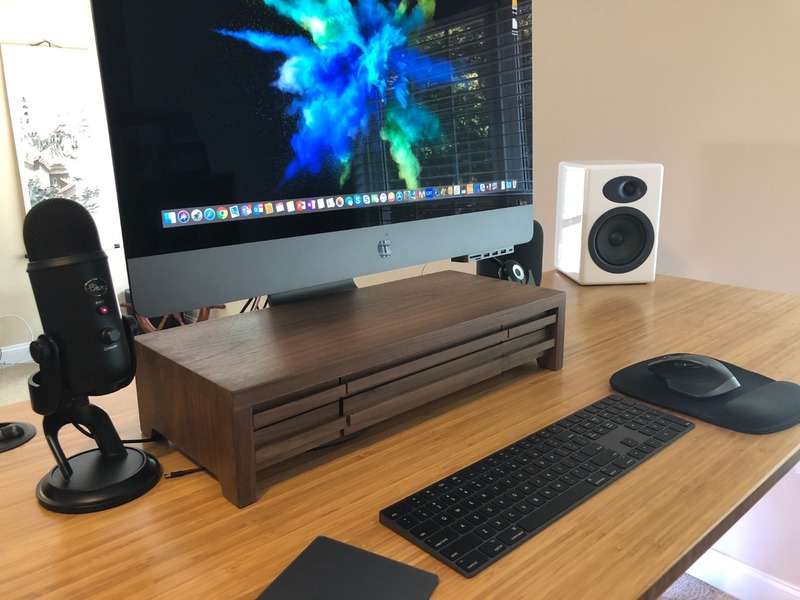 The monitor stand is well built, and looks extremely nice. Although, I think the hidden compartments are more trouble than they’re worth. All in all, an excellent product, as well as great customer service. Very difficult to find products that are this well built anymore. The miter joints are beautiful, the wood is solid and the drawers are all milled to fit perfectly. Nothing cheap about this stand. I’m not sure how many of these stands they produce, but for a mass produced product, it feels and looks more like a customer built valet box or jewlery box. For the price, it’s a very good value. Love it. 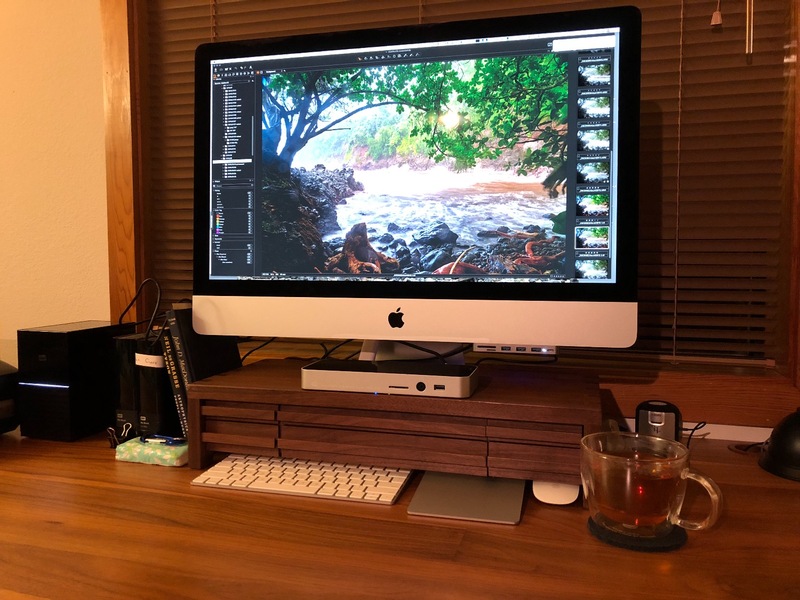 My family used to refer to my workspace as “the hellmouth” because of its festering pile of cables, peripherals, and bug-infested coffee cups. 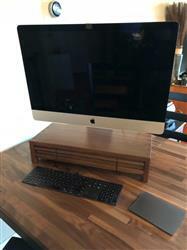 After purchasing an iMac Pro, I knew I needed to change my ways. The Planet 6 Walnut came to the rescue with enough storage capacity for the tablets, mice, and solid state external drives that used to clutter my desk. Its thoughtful, elegant design and exquisite craftsmanship give me joy each day. 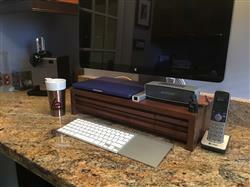 If you just want something cheap to hold up your computer, dig out some old college textbooks. If you’d prefer an elegant, practical, furniture-quality piece with the beauty of reclaimed wood, order a stand from Understands. Love this stand. The walnut is a nice rich brown and not faded like some walnut can be. The dovetails are precise. 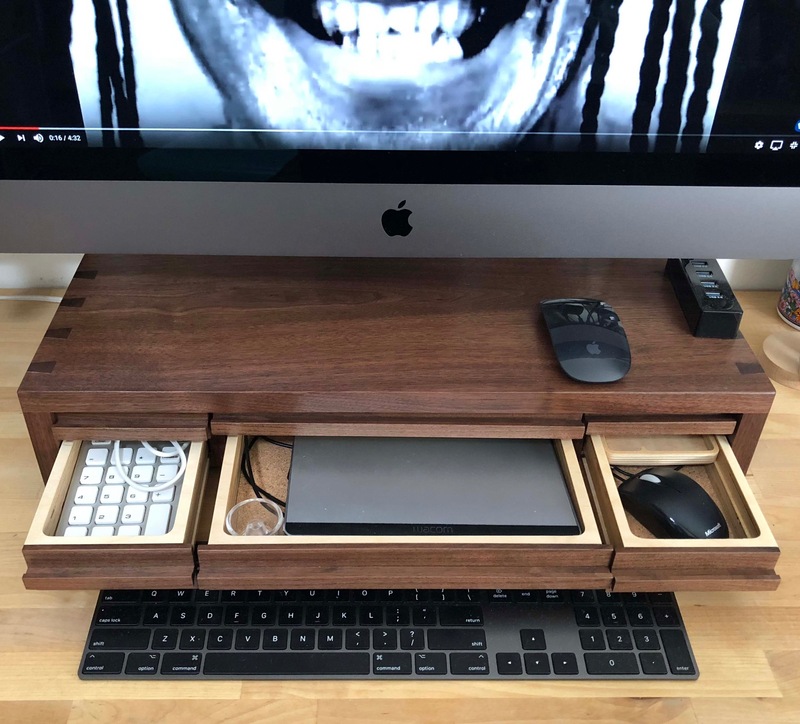 The drawers smooth. The interior dimensions of the drawers fit my needs exactly. It’s perfect.